The EXC-1553UNET/Px is an intelligent, single - or - dual channel, MIL-STD-1553 adapter. Its small size and ability to interface through USB or Ethernet interfaces make it a complete solution for developing, testing and performing system simulation of the MIL-STD-1553 bus, both in the lab and in the field. The EXC-1553UNET/Px shares its API with the entire Px family so that applications currently running on PCI, PCIe, ExCARD or PCMCIA boards will run without change on this device. 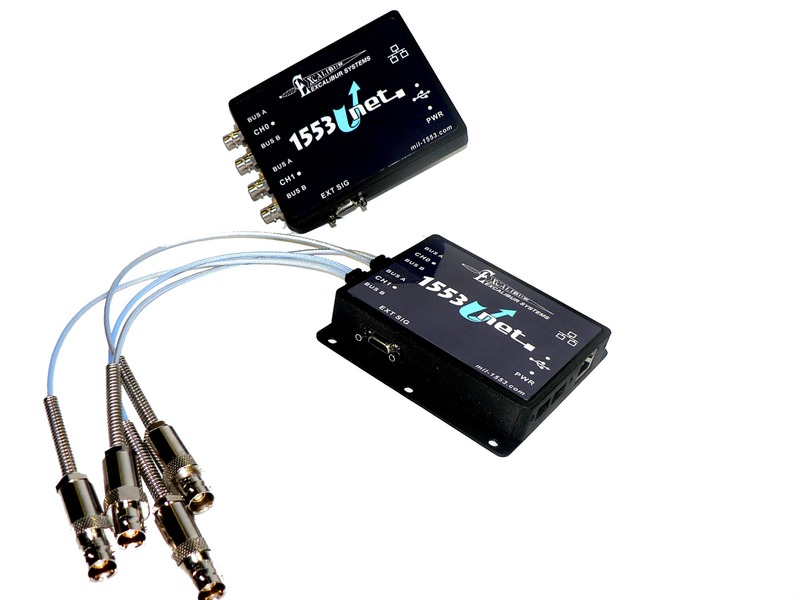 In addition the EXC-1553UNET/Px(S) provides 8 I/O Discrete signals and an IRIG B input. Each channel of the EXC-1553UNET/Px operates simultaneously as a Bus Controller and/or multiple (up to 32) Remote Terminals, or as a Triggerable Bus Monitor. The card supports error injection and detection. The adapter’s small size and compatibility with any computer using USB or Ethernet, makes it the perfect solution for performing system simulation of the MIL-STD-1553 bus, in the lab and in the field. Each channel of the EXC-1553UNET/PxS operates either as a Bus Controller, Remote Terminal, or Bus Monitor. The EXC-1553UNET/Px and EXC-1553UNET/PxS adapters are supplied with C drivers, including source code and may be used with Exalt, Excalibur’s Analysis and Laboratory Tools, a Windows monitoring application (only versions 8.1 or higher). "-D" 1553 Direct bus coupling.